Cochin Shipyard Project Officer Recruitment 2019: Good news for the candidates who are searching for latest job openings in Cochin Shipyard Limited. Yes, the higher officials had released Cochin Shipyard Recruitment 2019 Notification for 40 Senior Project Officer & Project Officer Posts. For this Cochin Shipyard Project Officer Jobs application process already started and the application process end date on 24th April 2019. Last Date of receipt of Online Application print out 30th April 2019. Interested candidates can check the Eligibility Criteria, Salary, Selection Process, Age Limit, Application Fee and Application Process details from this article. All the job seekers should utilize this great opportunity by applying for Cochin Shipyard Project Officer Vacancies 2019. Moreover, at the end of this page, we have given a link to download Cochin Shipyard Project Officer Recruitment 2019 Notification. The Cochin Shipyard Limited officials want to fill up 40 Senior Project Officer & Project Officer posts in their organization. For this application process already started. Interested candidates should apply for Cochin Shipyard Recruitment 2019 through online before 24th April 2019. For all the applied candidates the Cochin Shipyard Limited recruitment team will conduct the Personal Interview. Aspirants who will give the best performance in the entire recruitment process, they will get a job in Cochin Shipyard Limited. More details about Cochin Shipyard Project Officer Recruitment 2019 mentioned in the below section. In this section, we had provided Post Wise vacancy details for Cochin Shipyard Project Officer Jobs 2019. Degree in Mechanical/ Electrical/Electronics/ Civil Engineering with 60% of marks from a recognized University. Candidates can also check the official notification to know more information about the Eligibility Criteria. The Cochin Shipyard Limited officials will conduct the Interview for all the applicants. Aspirants who will give the outstanding performance, they will get a job for the applied posts. Candidates who want to apply for Cochin Shipyard Project Officer Recruitment 2019, they can check the fee details from this section. Here we have shared salary details for each post. Candidates can check those details and apply for Cochin Shipyard Project Officer Recruitment 2019 as soon as possible. Upper age limit for Senior Project Officer is 35 years, Project Officer is 30 years. Age relaxation for SC/ ST is 05 years and OBC is 03 years. Cochin Shipyard Limited main page will open. Go to Careers option and click on it. A page will open about all recruitment notification related. 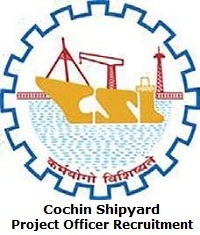 Find the Cochin Shipyard Project Officer Recruitment 2019 Notification link and hit on it. Read all available data on the Notification and click on apply online option. Fill all the important details in the required fields. Make the payment through online and hit on submit button. We ensure the above provided information about Cochin Shipyard Project Officer Recruitment 2019 Notification is very helpful for all the job seekers. Candidates if you have any queries, then leave a comment in the below provided comment box. For more similar updates keep visiting Sarkari Recruitment frequently. Candidates can also share this article with your friends too. Thank you.